*ENHANCED* NOW WITH 12 MORE ANTI-REDNESS, ANTI-SPLOTCHINESS, SKIN CLEARING AND ANTI-AGING INGREDIENTS. Returns clear, supple, healthy, younger, glowing skin, restoring skin’s ph balance, reducing redness, splotchiness and intensity of flare-up’s. 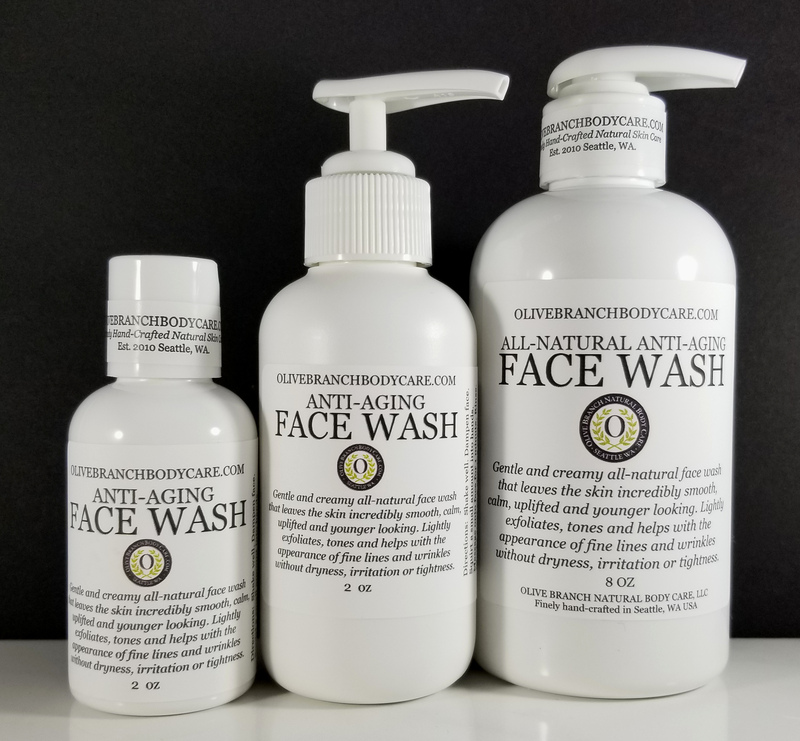 Use after our Anti-Aging and Restoring Face Wash and follow with our Rosacea Elixir, then our Anti-Aging and Restoring Face Lotion or Anti-Aging and Restoring Face Cream. Finish with our Lift and Contour Gel for maximum anti-aging benefits. Directions: Shake well. Squirt onto cotton ball and apply to face, neck and chest and night (avoid eye area) after cleansing with Anti-Aging & Restoring All-Natural Face Wash. 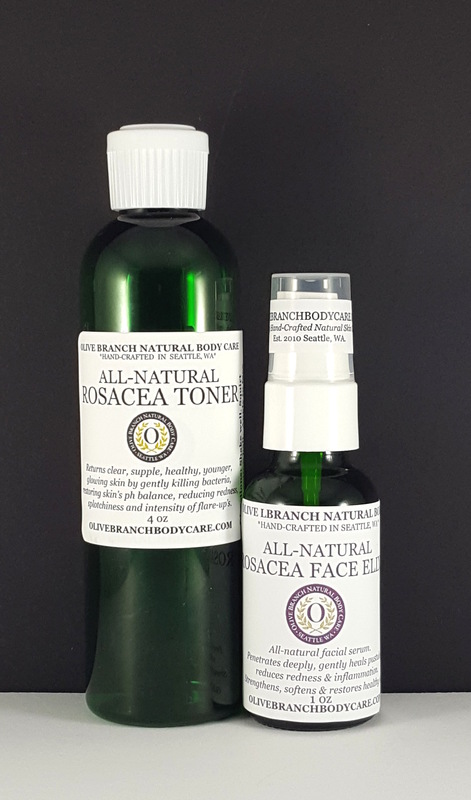 Follow with the All-Natural Rosacea Face Elixir (apply to the bumps, broken capellaries and pustules) and then the Anti-Aging & Restoring Natural Face Lotion or Anti-Aging & Restoring Natural Face Cream. For further reduction of redness, increased clarity and skin brightness mix a very tiny amount of the Finely Hand-Ground Natural Vitamin C Powder (skin booster) in the palm of the hand with the Face Lotion or Face Cream. We use PET bottles that do not allow the plastic to absorb into the natural ingredients and are food grade, safe, non-toxic, strong, lightweight and made from flexible material that is 100% recyclable. "I never write product reviews, but this product is so good that I'm compelled to let others know! I've tried several other products to help with Rosacea, including prescriptions, and this is by far the best. 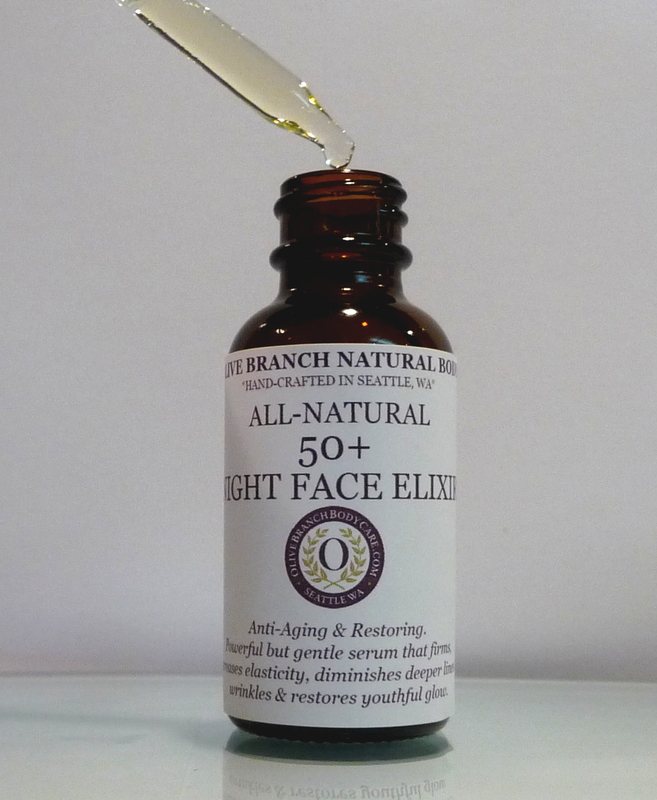 I use it with every morning with the Olive Branch Rosacea elixir and it consistently keeps the redness down. I experience allergic reactions from other rosacea products but have never had any trouble with this. This combination of products also keeps my face moisturized where other products dry it out. Highly recommend." Ingredients: Distilled Water, (Organic) Pyrus Malus (Apple) Fruit Extract (unfiltered apple cider vinegar), Magnesium Ascorbly Phosphate (Vitamin C), (All-Natural Preservative: Glycerin (and) Leuconostoc/Radish Root Ferment Filtrate (and) Lonicera Japonica (Honeysuckle) Flower Extract (and) Lonicera Caprifolium Salix Nigra (Black Willow) Bark Extract), Santalum album (sandalwood) hydrosol water, Helichrysum Italicum Distillate (Helichrysum Hydrosol) (Organic) Cucumis sativus (cucumber) fruit extract, Benzylalcohol dehydroacetic acid (eco-certified broad-spectrum non-paraben preservative blend), Aesculus hippocastanum (Horse Chestnut) seed extract, \Cymbidium Grandiflorum (Orchid) Flower Extract, Salix Nigra (Willow) Bark Extract, Lavandula Angustifolia (Lavender) Oil, Rosa Centifolia Absolute, Pelargonium Graveolens (Rose Geranium) Oil, Olea Europaea (Olive) Leaf Extract, Ichorium intybus (Chicory) root oligosaccharides, caesalpinia spinosa gum, Terminalia Ferdinandiana (Kakadu Plum) fruit extract, Melaleuca Alternifolia (Tea Tree) Leaf Oil, (Organic) Chamaemelum nobile (Roman Chamomile), Frankincense (Boswellia frereana) Essential Oil, Ceramide 3 (naturally plant derived), milk lipids, Sodium hyaluronate (highest grade), Hippophae Rhamnoides (Sea Buckthorn) Seed Oil, Daucus Carota Sativa (Carrot) Seed Oil, Citrus Aurantium (Neroli) Oil, Aloe barbadensis. 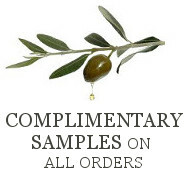 *ENHANCED NEW INGREDIENTS INCLUDE: Horsechestnut Extract, Orchid Extract, Olive Leaf Extract, Chicory Root, Kakadu Plum Extract, Lacto Ceramides, Hyaluronic Acid, Aloe Vera, Organic Seabuchthorn Seed Oil, Neroli Essential Oil, Frankincense Essential Oil, Carrot Seet Oil.